I've been a fan of the universal remote control concept for years, and have owned quite a few, including a brief foray into PC based home-brew solutions, but each have had their own issues, making none an ideal solution. That said, the current generation of Logitech Harmony products has definitely progressed to the point at which they're something I would recommend for my Dad - because the annoyances have been surpassed by the usefulness. So - which one to go for? Well... the first area to avoid is big fancy LCD touchscreens. Yes - they can be good to visualize your favorite channels, but 95% of the time when you've got a remote in your hand, you want to be looking at the TV, not down at the remote. The second issue with LCD based remotes is that they use a lot more power, resulting in something with a rechargeable battery that needs an always on charger (and finding that your remote is out of juice just when you need it most). 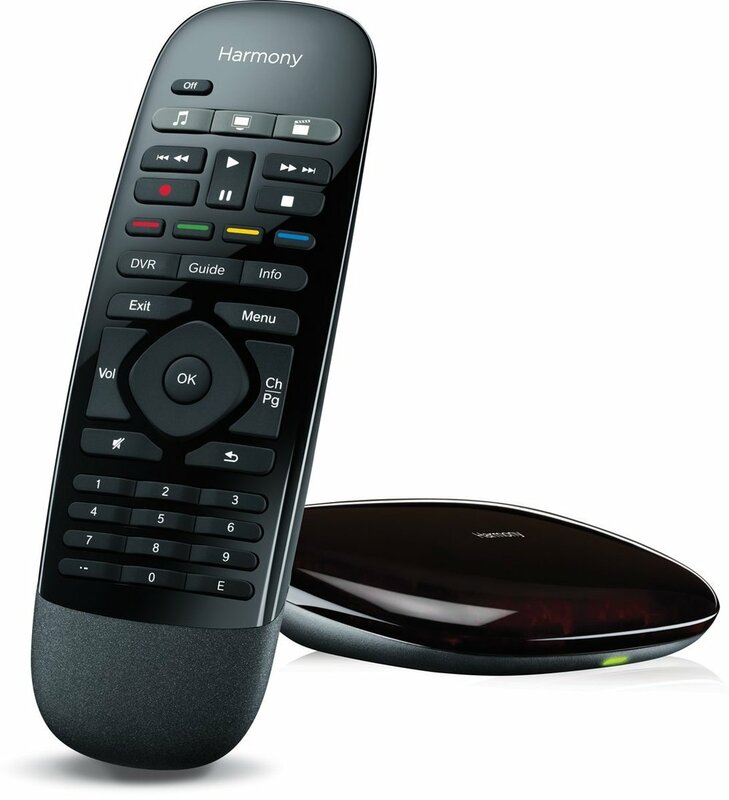 So looking for a remote that's all hard-buttons, the best of the bunch I've found recently is the Logitech Harmony Smart Control (UK £69.64) or (US - $99) or elsewhere. This is a tiny but well balanced unit with just the right number of physical buttons (no LCD) to control up to 8 devices through up to 6 macros. It is powered with a simple 3v button cell battery which seems to last ages, so no need for a vampire-power-sucking battery charger. It is also hidden behind a solid door that's quite hard to get open making it less of a concern if you've got small children running around. The remote has no IR emitter, instead using a wireless connection between a hub unit located close to your TV kit. This means no need to point the remote at the TV - which is liberating, and also allows you to hide your AV kit behind closed doors. I was at first concerned that the latency or lag between a button press and the IR code would be annoying, but I now don't notice any difference between button presses on the Harmony remote vs the original remote. The hub connects to your local WiFi network (802.11 b/g/n wireless home network, WPA Personal, WPA2-AES and 64/128-bit WEP encryption), and contains one IR emitter on the unit along with a second on the end of a cable, allowing you to have your kit in 2 different places. Your button presses pass over a wireless connection, then are sent by the hub out of one or both of the IR emitters to your AV gear. You can program the 3 buttons at the top of the remote to start up to 6 activities (3 on a quick press, 3 on a long press) which trigger sets of commands to switch on and configure your TV, HiFi, PC etc. When switching from one activity to another, the system remembers what you were last doing, and shuts down anything you're not using in the new activity. In addition to these dedicated mode buttons, you can re-program any of the other buttons on the unit to specific functions via either a long-press or a short-press. The link to WiFi also allows the use of a smartphone app (supporting both iOS/Android along with both phones & tablets), however I've had limited use for this. It has a gesture based control system, which is pretty clever (if you can remember which of the possible 22 gestures you programmed for which function), along with an area for favorite channels and one hosting pages of individual buttons. Usefully, the hub maintains a central record of the state of the system, so you can start something on the remote, then switch to the app, and it will remember which mode you were in. It is useful when you need to find an esoteric button that isn't on the handheld remote, or if the remote has hidden itself somewhere out of sight, but for day to day use, the real remote is much more useful than having to find, unlock, then find the app, then find the right place in the app for the thing you wanted to do. Perhaps if I had a dedicated home theater tablet without a screen lock, I might find it more useful. The system currently supports Philips Hue lights, and I've been able to get the app to drive one of my lights, but so far I've been unable to get it to add the light to any of the macros. There's a new version out in the US called the Logitech Harmony Home Control (US) which adds 2 buttons for lights, 2 for appliances and another +/- button, but I've not had a chance to get my hands on one yet, so I can't comment on its flexibility. As with many of the older Harmony remotes, configuration is done through a web-based app, designed by a team of crack AV gear-heads. I say that because they've designed the workflow around how they think you'll use the thing to configure it - without giving visibility of the big picture. It is impossible to visualize the configuration on one page, then jump into the right spot, because you have to progress through a series of wizards to get to the appropriate setting. It's as if the guy that designed an Ikea store turned his hand to user interface design. The only saving grace of the software is that once it's setup you don't need to touch it again until you buy a new remote or a new bit of AV kit. So overall... once configured, this is the best universal remote I've ever bought!